Reading the daily headlines, it’s easy to forget that the corollary of a civilization in precipitous decline is a world of creative ferment, a new world struggling to be born. If you could have a God’s-eye view of all the creative resistance rending the fabric of political oppression from the U.S. to Indonesia to Colombia, you would surely be persuaded that all hope is not lost. 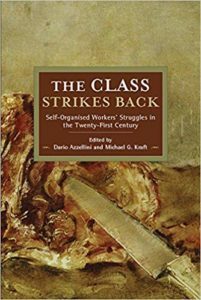 This conclusion is borne out in detail by a book published earlier this year, The Class Strikes Back: Self-Organised Workers’ Struggles in the Twenty-First Century, edited by Dario Azzellini and Michael G. Kraft. The chapters, each dedicated to a different case-study, survey inspiring democratic activism in thirteen countries across five continents. The reader is left with the impression that the global working class, while facing an uphill battle in its fight against imperialism, business and state repression, and conservative union bureaucracy, may yet triumph in the end, if only because of its remarkable perseverance generation after generation. Its overwhelming numerical strength, too, bodes well. In their introduction, the editors concisely state the book’s purpose: “This volume aims to examine how new, anti-bureaucratic forms of syndicalist, neo-syndicalist and autonomous workers’ organisation emerge in response to changing work and production relations in the twenty-first century.” Traditional unions, which they observe have been “part of the institutional setting to maintain capitalism” (my italics), have deteriorated on a global scale. In their place have sprung up more radical and democratic forms of resistance, such as blockades, strikes, and workplace occupations and recuperations. Workers’ actions have even made decisive contributions to the toppling of governments, as in Egypt in 2011. In this article I’ll summarize several of the most compelling case-studies. Unfortunately I’ll have to pass over many interesting chapters, including ones on the workers’ movement in Colombia, the solidarity economy and radical unionism in Indonesia, the sit-ins and ultimately the worker cooperative at a window factory in Chicago (about which I’ve written here), and the South African miners who were attacked by police and massacred in August 2012. The book is too rich to do justice to. Throughout the country collectives have established community kitchens and peer-to-peer solidarity initiatives for the distribution of food, reconnected electricity that was cut down to low-income households, organised “without middlemen” the distribution of agricultural produce, established self-organised pharmacies, healthcare clinics and tutoring programmes and organised networks of direct action against house foreclosures. All this flowering of alternative institutions has not occurred without significant problems and defeats. There has been little success in establishing solid organizations of the unemployed, and grassroots labor struggles have failed to form durable structures that can challenge institutionalized unionism. Certain victories, nevertheless, have been impressive. Social movements were able to prevent the government’s privatization of public water corporations in 2014. Even more remarkably, after the government closed down the influential public broadcaster ERT in 2013, ERT employees, together with citizens and activists, took over the production of television and radio programs by occupying premises and infrastructure. For almost two years the self-managed ERT transmitted thousands of hours of broadcasting on the anti-austerity struggle, serving as an important resource for the resistance. When Syriza came to power in 2015, it reestablished the public broadcaster. The Greek experience is of particular interest in that other Western countries, including the U.S., are likely to replicate important features of it in the coming years and decades, as economic crisis intensifies. We ought to study how Greek workers and communities have adapted and resisted, to learn from their failures and successes. The mass movement that felled Mubarak’s regime in 2011 received sympathetic coverage from the establishment media in the West, but the key role of workers’ collective action was, predictably, effaced. Strike waves after 2006 not only destabilized the regime but also gave rise to the April 6th Movement in 2008, which would go on to catalyze the 2011 rebellions. Even after the fall of Mubarak, the flood of labor actions didn’t let up. As everywhere around the world, neoliberalism meant decades of pent-up grievances against working conditions, privatizations, low wages, and economic insecurity. Finally in December 2006, 24,000 textile workers went on strike at Misr Spinning. Within a few weeks, “similar strikes were spreading between public and private sector textile producers, and from there to civil servants, teachers, municipal refuse workers and transport workers.” In the next couple of years, many more strikes occurred, frequently taking the form of mass occupations of workplaces. Workers even managed to form the first independent unions in more than fifty years, beginning with the Real Estate Tax Authority Union (RETAU), established in December 2008. The conservative and bureaucratic Egyptian Trade Union Federation was unable to cope with all the sit-ins, strikes, and waves of democratic organizing, and saw its influence over the labor movement wane. RETAU’s consolidation “accelerated the development of other independent unions and proto-union networks among teachers, public transport workers, postal workers and health technicians,” raising their expectations of what could be achieved through collective action. After the steadily rising wave of worker and popular resistance crested with the resignation of Mubarak in early February 2011, labor actions didn’t cease. In fact, Mubarak’s fall was followed by “a new tidal wave of strikes and workplace occupations, with nearly 500 separate episodes of collective action by workers recorded in the month of February 2011 alone.” Strike waves ebbed and flowed over the following two years, and did much to undermine the military and Islamist governments that succeeded each other before the crisis of the summer of 2013, when, after Mohammed Morsi fell, a successful counterrevolutionary offensive was launched by the Armed Forces, the Ministry of the Interior, the judiciary, and the media. After the fall of Mubarak, a ferment of self-organization resulted in the founding of many new independent unions, which often engaged in intense battles for tathir, or the “cleansing” from management positions of the ruling party’s cronies. This was especially the case in public institutions. Public hospitals in Cairo, for example, “were the scene of attempts to assert workers’ control over management to a much greater degree than had been possible before the revolution.” These experiments weren’t always successful, but in a number of cases they did at least force the resignation of old directors and were able to establish, temporarily, democratic councils to oversee work. In the end, the workers’ movement was unable to impose its demands on the agenda of national politics. Its leaders “did not score victories at that level on the question of raising the national minimum wage, or forcing a lasting retreat from privatization, or even of securing full legal recognition for the independent unions themselves.” Still, the authors comment that the nationwide revival of self-organization was an astonishing feat. “Factory and office workers created thousands of workplace organisations, despite conditions of acute repression and the lack of material resources. There have been few examples on this scale of a revival of popular organisation in the Arab world for decades.” Memories of these uprisings will not be erased easily, and will inspire the next generation of activists. Venezuela differs from the other cases in that its Bolivarian revolution has entailed a commitment to elevating the position and the power of workers. So how successful has this process been? In recent years, of course, Venezuela’s severe economic crisis has undermined the Bolivarian process, with increases in poverty and less money going to social programs. But the achievements have not all been destroyed. The account in the book goes up to early 2016, well into the crisis years. Until 2006, the Chavez government focused on promoting cooperatives (in addition to nationalizing the oil industry and expropriating large landowners). In nationalized medium-sized companies, for example, workers became co-owners with the state. Whereas Venezuela had had only 800 registered cooperatives in 1998, by mid-2010 it had 274,000, though only about a third were determined to be “operative.” It had been hoped that these businesses would produce for the satisfaction of social needs rather than profit-maximization, but the mixed-ownership model, according to which the state and private entrepreneurs could be co-owners with workers, vitiated these hopes. In 2008 a new model for these companies emerged, the Communal Social Property Company (EPSC). “While different kinds of EPSCs can be found in the communities today, their principal areas of activity correspond with the most pressing needs of the barrios and rural communities: the production of food and construction materials, and the provision of transport services. Textile and agricultural production companies, bakeries and shoemakers, are also common.” Under the initiative of workers, even some state enterprises are partly under community control, at least regarding their distribution networks. Despite all the advances made under Chavez, the fact is that the economy’s social relations of production have not really changed and capitalist exploitation remains the norm. Private interests are still too powerful and have too much influence over the government, promoting mismanagement and corruption. It is still a rentier economy. But a revolutionary process has begun and is being carried forward by communities and workers across the country. The transformation of a society from authoritarian to democratic does not happen overnight. Like the rest of the post-Soviet world, Bosnia-Herzegovina has suffered terribly from the privatizations, asset-stripping, marketization, and rampant corruption that have attended its transition to capitalism since the mid-1990s. Unemployment and economic insecurity are at epidemic proportions. In 2014, workers in Tuzla, Bosnia’s third largest city, organized a massive mobilization against their deteriorating conditions, the first since the 1992–95 conflict. While the movement didn’t last, its legacy may inspire further mobilizations in the future. The 2014 demonstrations were a response to the wretched situation of workers in a laundry detergent factory, DITA, which at one time had provided 1,400 jobs. After its privatization in 2005, things started to go downhill. The company paid them minimal wages, issued meal vouchers only in bonds rather than cash, and eventually stopped paying them pension funds and health insurance. In 2011 they began a long strike, but in December 2012 the firm closed, having ignored all their demands. Picketing the factory and filing lawsuits didn’t secure justice for the workers, so in February 2014 they teamed up with their counterparts from four other nearby factories to stage demonstrations in front of Tuzla’s canton court. All five work forces had similar demands: investigation of the questionable privatization processes that had destroyed their livelihoods; compensation for unpaid wages, health insurance, and pensions; and the restarting of production. Their demands didn’t get a very sympathetic hearing: during one of the demonstrations, riot police secured the entrance of the canton building and fired teargas and rubber bullets. This brutality only further inflamed the workers, who kept up their resistance the following couple of days. The number of demonstrators rose to 10,000 as students and other citizens joined the protests, finally setting the government buildings on fire. A new labor union was also formed in the wake of the protests, called Solidarnost, which quickly reached 4,000 members from dozens of companies. It was intended as an alternative to the conventional unions that had so signally failed to protect the interests of their rank and file. While it didn’t succeed in winning the battle for the workers, it did keep fighting for years afterwards, as by staging weekly protests in front of the canton court. The moment of collective outrage slowly faded away, especially after the flood that hit the country in May 2014 turned into a national emergency. The workers at the DITA factory, however, still did not give up: in March 2015 they occupied the factory and restarted the production of cleaning products, publicly appealing for international support. Shops and retail chains decided to sell the “recuperated factory’s” products, and groups of activists volunteered to help the workers optimize production. In general, Milan comments, the uprisings left a legacy of solidarity and activist networks, which challenge “the dominant rhetoric of ethnic hatred” and may be drawn on in future struggles. The path forward for the working class in an age of neoliberal crisis is tortuous and uncertain. Given the near-collapse of mainstream trade unionism and many left-wing political parties, it’s necessary for people the world over to forge their own institutions, their own networks, to fight back against the rampaging elite and construct a new, more equitable society. The stories collected in The Class Strikes Back are an encouraging sign that workers everywhere are already waging the war, that democratic institutions can germinate in even the most crisis-ridden of societies, and that the ruling class’s hold on power is, in fact, ultimately, rather tenuous. The next generation of activism is sure to bring major changes to a morally corrupt civilization. Chris Wright has a Ph.D. in U.S. history from the University of Illinois at Chicago. He is the author of Notes of an Underground Humanist and Worker Cooperatives and Revolution: History and Possibilities in the United States. Read other articles by Chris, or visit Chris's website. This article was posted on Sunday, August 26th, 2018 at 11:32pm and is filed under Austerity, Book Review, Bosnia-Herzegovina, Co-operatives, Egypt, Greece, Neoliberalism, President Hugo Chavez, Privatization, Solidarity, Unions, Venezuela, Working Class.